Martin Luther King led the Civil Rights movement during the 1960s, and his strategy was to use the non-violent tactics that Ghandi had successfully employed to propel India’s independence from Great Britain 20 years earlier. In the southern regions of the United States (and some other parts of the nation) African-Americans were not even allowed to sit in a restaurant next to where white people sat. As ridiculous as this seems, most white southerners supported this policy. A century after the Civil War they were still bitter over losing that conflict, and they resented being forced to treat African-Americans as equal citizens. Whenever a white southerner claims they are against the “tyranny of the federal government” what they really mean is they resent not being allowed to oppress African-Americans. This hypocrisy has always annoyed me. Many white southerners believe in oppressing other people, yet they act as if they are the victims of oppression. 56 years ago, Civil Rights protestors dared to sit at the segregated lunch counters of Woolworth’s Department Stores. Below is a photo of 1 famous incident when a gang of mostly white teenagers harassed them. 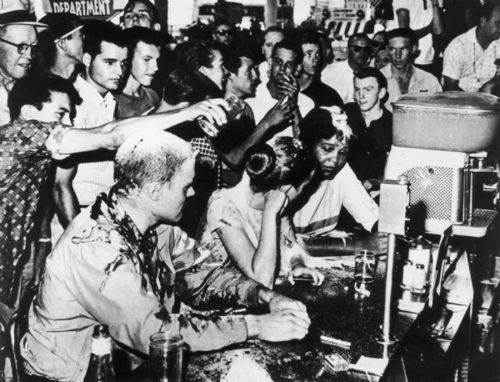 The Civil Rights protestors used non-violence, and passively sat there while they were being abused. The young punks dumped milk shakes on their heads, and threw food on them. Finally, 1 of them dragged an African-American off his stool and repeatedly kicked him in the face, while a white police officer stood by and did nothing. The police man eventually arrested both of them, as if the victim was just as guilty as the perpetrator. The Civil Rights movement was ultimately successful…within the following few years both the Civil Rights Act and the Voting Rights Act officially guaranteed the equal status of African-Americans, though white southerners still opposed these federal laws on the grounds of states rights. And an extremist right wing Supreme Court has gravely weakened the latter. The famous lunch counter sit-in at a Woolworth’s in Greensboro, North Carolina. I bet every single member of that white mob that is still alive voted for Donald Trump. It occurred to me when I looked at this photo that most of the white people in that mob (the shmucks who are still alive, at least) were about 69 years old during the 2016 election and that every single 1 of them likely voted for Donald Trump. People change. It’s possible 1 or 2 of them has been enlightened, and now has more liberal views, but I doubt it. Trump directly appealed to racists and xenophobes in the United States during his campaign. He still frequently appeals to them during his presidency, making him the most divisive president in U.S. history. (and, no, Obama was not a divisive president. It wasn’t his fault that racists kept getting more and more pissed off over the years because a black man was president.) Trump opened up his campaign by scapegoating Mexicans and Muslims. This alone should have been enough to disqualify him from getting elected, but instead it awoke an ugly part of America that unfortunately was populous enough to get him over the electoral finish line in our archaic election process. (The electoral college is a throwback to when the framers of the constitution went out of their way to appease the slave-holding states.) Now, many politicians are copying his tactic, though I’m skeptical it will continue to work. White racists are outnumbered. I hate Donald Trump, but he is just 1 sleazy real estate crook. I hold more hatred for the disgusting ignoramuses who voted for him. Trump-voters are the same kind of people who put my relatives in concentration camps during WWII. It infuriates me how they are so easily taken in by a con artist who plays on their unfounded fears of brown-skinned people. The latest controversy is over Trump’s racist wall. The government has been shut down for over a month because of this nonsense. The wall–an impossible boondoggle–would stop no one from coming in this country. People can tunnel under it, climb over it, fly over it, come here legally and overstay their visa, or go to Canada and walk across the border where there is no call for a wall because Canada is a mostly white country. Racists don’t fear Canadians. Hispanics are no threat to us. In fact they can save Social Security by contributing to payroll taxes. The racist wall is simply a symbolic message that states brown-skinned people are not welcome here. That is why it is an immoral wall. I stand with Nancy Pelosi. This entry was posted on January 21, 2019 at 3:00 pm and is filed under Standing on my Soap Box. You can follow any responses to this entry through the RSS 2.0 feed. You can leave a response, or trackback from your own site. Understood..good person..understood! Me n mine..live by the term..’family of man’. We are all ..members of the human race. I am ‘blood’..with all. Where we move about..as each new day starts..we hold our individual morning greetings..to greater world..asking that we..be part of the helping, the healing..and the calming..of where we are..and also..anywhere..around the globe. Our 2 sons were raised with a newspaper picture of him..and his speech..in our telephone alcove..in the kitchen. As I find myself..in towns around me, clinics or hospital er’s..i watch those..passing about. I almost always..find a body exhibiting tiredness, or an expression..looking TOO tired, looking overwhelmed. Being a creative..to the max..i find a rather swift way to..move near them, offer a comment..pause..to see if they ‘wish to engage’..and ans. their comment..then my..fast ‘step two’..is a humorus ending..or calming ending. A good smile..and I am..withdrawing..peacefully. I from my training..know that the ‘good feelings and chemical feeds..in such interactions..last 30 to 45 min..after the encounter. So..where I attend no church..i ..give..to any I see..who might need a little..uplift. It is my way..of denying trumps messages, and his broken personality. I..fight him/his..ON The Ground..and as long as he is..in the white house..this is me..COMMING IN HOT!! At 81..i see this as a fight..which must..be won. What’s out of date about it? Trump voters are just as racist as anti-Civil Rights southerners. In fact lots of them are the exact same people.